My dad started Owens Pools in Jasper Oregon in the late 1960's and building pools has been our family business ever since. I grew up running around on build sites, learning the art and craftsmanship of building quality swimming pools. We specialize in custom projects including stainless steel gunite hybrids, gunite, and all tile poured concrete hot tubs. We also offer a variety of vinyl liner swimming pools and vinyl liner replacements. We only use the highest quality materials available. Including proudly offering Jandy equipment packages on all our new builds with a generous 3 year warranty. Read about our company in two articles in Aqua Magazine. We do everything from start to swim, including free designs. We look forward to helping you make an investment in your family! After having another Eugene pool repairman refinish our pool and making a HUGE mess, David stepped in and totally fixed the problems, plus made our pool beautiful!! He was very easy to work with. We would highly recommend him!! We had bought a house that we could put in a pool for our daughter who has a chronic pain condition. We were using the only local pool guy, signed his contract, money down, then He backed out. I did not know what to do. Then came Dave to the rescue. Dave came from out of town, and gave us so much knowledge that we knew from the get go he was our man! His knowledge about the pool industry was amazing. He did an awesome job meeting our needs, and the needs of the job. He also worked great with our other contracters for our house addition. Dave delivered on everything he said he would plus more. He not only saved us for doing the pool,we had a lame floor guy walk off the job, Dave knowing I couldn't move my daughter in until it was done, Stayed and installed it with us! Dave's work ethic and true kindness is very evident! He goes the extra mile, and never left anything undone, even when it wasn't his job to do. I would highly recommend Dave for any and all pool jobs! Super Guy! David Owens is great to work with! He was able to install a beautiful pool that meets our needs. We had done some research, but David patiently shared his knowledge and let us decide. He did the whole job and stayed within our budget. We would recommend him to anyone considering a pool. We love our pool! Dave is a hard working honest guy who has an exceptional eye for detail. It is not often that a person can get those qualities AND the finished job for the most reasonable quote but I am here to say, that in the case of Oregon Water Effects, you do get both. The best job at the best price with a personal attention to detail is what I have come to expect in dealing with Dave. When we decided to add a pool to our back yard we didn't know where to go...... I found Dave in the yellow pages and set up a meeting. The information he provided the first time we met was incredible!! We had spent weeks researching on the internet, and didn't learn half of the information he provided. Needless to say he helped convince my husband that vinyl liner was the way to go. 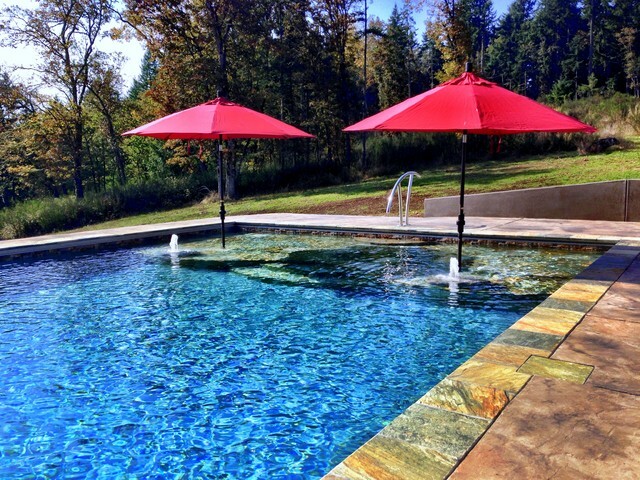 We got the quote, submitted our permit, and had the pool installed and full of water in under 6 weeks. We only had a few weeks left before the cold weather came, but we continue to enjoy the light glowing in the night, and listening to the waterfall. We can't wait for summer to come...... next year we want to install a winter heater so we can enjoy it all year!! We had looked at at least three other companies in the area prior to Oregon Water Effects and I can't repeat enough how knowledgeable and competent Dave and Travis are. I would recommend them a hundred times..... and I am working on it! In today's economy especially we are glad for the investment we made in our home and our family. ###Raising 4 boy's with a pool is a blessing, not to mention all the great gatherings the adults have in the luxury of our beautiful pool and patio put in by Dave at Oregon Water Effects.###He is very knowledgeable in the pool business, very accessible should we need service.###We like the fact that we don't have to travel to have a vacation.###GREAT FAMILY FUN!! !######Sincerely,######Dave & Holly Carothers###Mack, Jedd, Vann & Luis too! Dave Owens installed a new liner in our pool, fabricated steps and new cowling. The results are far better than the original design. I would not hesitate to refer Oregon Water Effects and Dave Owens to anyone. We are so happy with our beautiful "new" pool.